Those are the words of RavichandranTharumalingam, who from 19th January spent eight days climbing the famous Mountains of the Moon, the Rwenzori Mountains. He summited to the highest point, Margherita peak on Mt. Stanley, at 5109m. 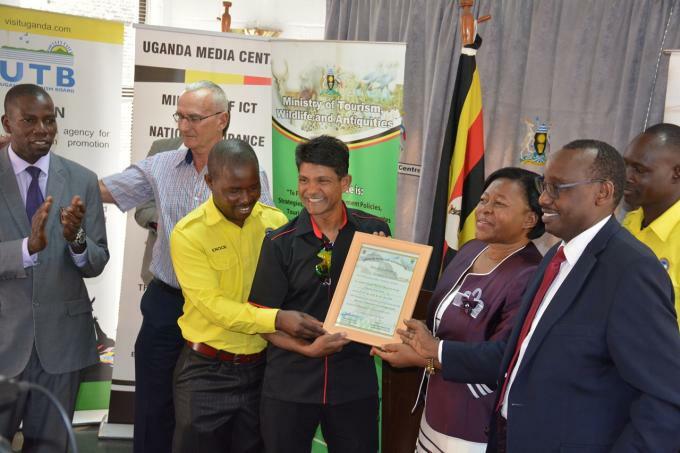 Fondly known as Ravi, the climber was on his first trip to Uganda at the invitation of the Uganda High Commission in Malaysia and hosted by the Ministry of Tourism, Wildlife and Antiquities and its agencies. Ravi�s nod for the Rwenzoris is no mean approval. The Malaysian climber is one few humans who have climbed the world�s highest peak, Mt. Everest. That group gets smaller considering that Ravi went as a solo climber to conquer Mount Everest and is listed in the Malaysia Book of Records for his feat in climbing the 8,843.43m mountain on May 15, 2006. His badge of honor for his mountaineering feat is the eight fingers he lost after a rope cut through his frozen hands during a climb. Ravi praised Uganda for persevering the Rwenzori environment, which he found very unique and unlike any other he had seen in mountains he had climbed on all the continents. This, he said, is Uganda�s biggest seller for mountaineers. Amb. Dorothy Hyuha, Uganda�s envoy to Malaysia, says the mission worked together with Malaysian organisation to identify a high profile individual to promote Uganda as a tourism destination. She added that the mission is has taken up the call to use diplomacy to bring economic benefits to the country. The Uganda Tourism Board (UTB), which facilitated the mountain climbing trip, has together with other partners developed a strategy to market and promote the Rwenzori. Ravi�s Rwenzori challenge was supported by both private and public sector institutions among them the the Rwenzori Trekking Services, the Ministry of Tourism, Wildlife and Antiquities, Ministry of Foreign of Foreign Affairs, the Uganda High Commission in Malaysia, Uganda Wildlife Authority, and Uganda Tourism Board. Tourism has emerged as Uganda�s top export bringing in over UGX1.3billion, employing over 450,000 and a major contributor to GDP at 10%. The country�s international profile is also growing and more favorable for travelers around the world. The Rwenzoris � the fabled Mountains of the Moon � lie in western Uganda along the Uganda-Congo border. The equatorial snow peaks include the third highest point in Africa, while the lower slopes are blanketed in moorland, bamboo and rich, moist montane forest. Huge tree-heathers and colorful mosses are draped across the mountainside with giant lobelias and �everlasting flowers�, creating an enchanting, fairytale scene. Rwenzori Mountains National Park protects the highest parts of the 120km-long and 65km-wide Rwenzori mountain range. The national park hosts 70 mammals and 217 bird species including 19 Albertine Rift endemics, as well as some of the world�s rarest vegetation. The Rwenzoris are a world-class hiking and mountaineering destination. A nine- to twelve-day trek will get skilled climbers to the summit of Margherita � the highest peak � though shorter, non-technical treks are possible to scale the surrounding peaks. � The park was gazetted in 1991 and was recognized as a World Heritage site in 1994 and Ramsar site in 2008. � Highest point: 5,109m above sea level on Mt Stanley's Margherita Peak. Mt. Stanley is bisected by the border with the DR Congo. � The Rwenzori is not volcanic like East Africa�s other major mountains but is a block of rock upfaulted through the floor of the Western Rift Valley. � The Rwenzoris were christened the "Mountains of the Moon" by the Alexandrine geographer Ptolemy in AD 150. � The oldest recorded person to reach Margherita Peak was Ms Beryl Park aged 78 in 2010. Uganda Tourism Board (UTB) is a statutory organization established in 1994 whose role was reviewed in an act in 2008. The Board's mandate is to promote and popularize Uganda as the preferred holiday destination both locally and internationally. The broader goals of the Board are to increase the contribution of tourism earnings and GDP; improve Uganda's competitiveness as an international tourism destination; and increase Uganda's share of Africa's and World tourism market. UTB aims to create inclusive opportunities for the tourism sector through market transformation. We envision a sustainably promoted and developed tourism sector contributing very significantly to Uganda�s economic development. Mission: To coordinate and steer programmes that lead to development of a sustainable and competitive tourism industry in Ugandain partnership with stakeholders. Uganda Tourism Board is the official Government destination marketing agency for Uganda. Uganda Tourism Board (UTB) has the responsibility of developing, promoting and coordinating a sustainable and competitive tourism industry.